The Spinone Italiano is a loyal and tender breed that is out to please. It is a friendly and affectionately warm breed that bonds well with other dogs and especially with children. Although it is one of the most easygoing pointing breeds, the Spinone Italiano is a brave and fearless dog. The Spinone Italiano requires exercise on a daily basis. These needs can be fulfilled through various forms of physical activity including lengthy walks, jogs, or runs. It especially enjoys these activities when off of the leash. The Spinone Italiano can survive in temperate to cool outdoor environments; however, it is better suited as a house pet. It loves to spend time with the family. Maintenance of the coat of the Spinone Italiano requires brushing once per week. Occasionally, hand-stripping on the face and feet may be required as well. The Spinone Italiano has one major health concern, which is Canine Hip Dysplasia, or CHD. Canine Hip Dysplasia is a disease that may cause an unstable hip joint. Minor health concerns for this breed include ectropion, gastric torsion, otitis externa, and cerebellar ataxia. Elbow dysplasia and allergies are seen occasionally in the Spinone Italiano. To keep the breed healthy, regular testing of the hips and eyes are suggested. The average life span of the Spinone Italiano is 12 to 14 years. 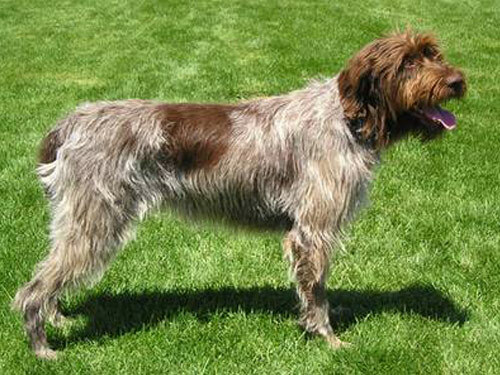 The Spinone Italiano name is derived from the Italian word pino, which is an Italian thorn bush. This name was earned because the breed has the ability to hunt for small game through rough terrain and coarse bushes. A single Spinone Italiano is referred to as a Spinone, while more than one is referred to in the plural form, which is Spinoni. One of the first breeds created to be a pointing dog is the Spinone Italiano. There is evidence dating back to 500 B.C. that reveals the existence of wirehaired pointing dogs and there is also an indication of the existence of this breed in fifteenth and sixteenth century Italian art pieces. While this evidence exists, the actual root of where the Spinone Italiano came from is still unknown. There are some theories that claim that during the Roman Empire it arrived in Italy along with Greek traders, while others suggest it was derived from the Celtic wirehaired breeds. With no records to substantiate any theory in particular and a lack of records, the only facts that are accepted in regards to the development of the Spinone Italiano are that it can be traced to the Piedmont area of Italy. With the ability to hunt through thorny brush to find furred game, the Spinone Italiano made a name for itself. It also gained notoriety during World War II for its ability to track down German patrols. After the war ended, the breed was in a state of turmoil as the number of Spinoni dwindled and those that still remained were being crossed with other breeds. The breed was in danger of extinction until the 1950s when an effort was made by breeders to recreate it. The talent of the Spinone Italiano to hunt with abilities to point, set and retrieve effectively may have been what saved it. The Spinone Italiano remains a popular dog in Europe today and in particular Italy, but remains of modest popularity in America.